Across the West, a century of vigilant fire suppression has left many forests and prairies dangerously overgrown and degraded, prone to catastrophic wildfires that destroy homes and habitat. Members of The Nature Conservancy’s Southern Rockies Wildland Fire Module, a traveling fire crew of specially trained experts, spend their share of time wrangling wildfires. But they are also applying a science-based strategy to reintroduce and manage fire on the landscapes that naturally need it. There are just a dozen or so certified Type 1 Wildland Fire Modules across the country, highly trained groups of firefighters prepared to dispatch quickly to remote terrain, equipped with enough gear and food for at least two weeks. Most are run by the National Park Service or Forest Service. The Conservancy’s module is unique for being nongovernmental, and it is dedicated to not only fighting fires but also lighting them. 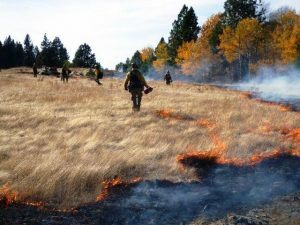 Its members are trained to use prescribed burns—blazes ignited under carefully controlled conditions—and to manage, rather than just suppress, naturally occurring fires as part of a healthy ecosystem. Since its creation in 2008, this Colorado-based crew has carried out about 60 prescribed burns on some 16,000 acres, and trained hundreds to tackle similar work.